Parachute games not only are fun; they also strengthen upper-body muscles, promote teamwork, and are noncompetitive. Don’t worry, you needn’t purchase a fancy nylon multi-colored round chute with handles (although they are available in most toy stores or toy departments of discount stores) to play parachute. A sheet or light blanket works just as well! Parachute games are fantastic activities to play at birthday parties, family reunions, picnics, vacations, and other events that include the whole family. 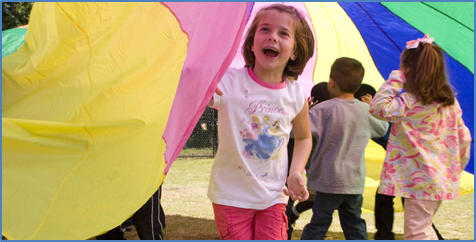 While most children enjoy parachute games, they are also beneficial and enjoyable for adults. Head outside, make sure you have plenty of room, and try your favorite parachute game or one of the variations below. • Popcorn: Place a number of beanbags or small, soft balls onto the parachute. Shake to make them pop up like popcorn. • Ball Roll: Cut a hole in the center of the parachute. Try to roll the balls into the hole in the middle of the parachute. Or, try to keep the balls from going into the hole! • Making Waves: Make small, medium, or large movements to make various types of waves. Tell a story about a ship on the sea as a storm sets in as you vary the force of the waves. • Merry-Go-Round: Turn your bodies sideways and hold the chute with one hand. Play music and walk around in a circle making a “Merry-Go-Round.” For variety, stop music as a cue to reverse and go the other direction. • Parachute Tag: Have everyone lift the parachute high over their heads. Call out two people’s names and have them run under the parachute to trade places. Have them try to complete the trading of places before the parachute comes down on them. Most importantly, have fun and enjoy time with your family!